I don't know anything about the main game mode, only played the free battle royale rip off mode. Played that mode loads. It's a rip off of that playerunknown battlegrounds (pubg) game, I'm not too up on that game but the main differences I think are that there are no vehicles in this and you can build stuff in this. There's some controversy about ripping off the idea, and maybe some other stuff, I'm not sure really. I guess the first copies of something popular always get more stick. On the plus side this game has sold me pubg and I'll be getting it on Xbox. Anyway back to fortnite, I think it's great, especially in a team, you start in the party bus with about 100 people with only a pick axe, look at the map, pick a spot to drop in, if there's people going to the same place do you try to get there first and get a gun and fight straight away, or divert to somewhere else. the map constantly shrinks in size as the storm covers the island, loot is random. I prefer to start near the outside in usually less populated areas, running in with the storm there's less likely to be people behind you, but you probably won't get as good loot as if you'd gone to a town. When you see someone do you fight or hide, there's constant decisions like this going on, it's always different and often cool stuff happens. when you get to the end do you build a fort or try and hide. I'm not sure I'm really explaining it very well but then apparently loads of people watch pubg on the internet so everyone probably already knows. I think my friend said this, it sums it up well saying it's a bit like playing a zombie/apocalypse survival film. The building works well too, you can get some really impressive structures people have built at the end. Anyway yeah it's really good, especially for free. Anyone else playing it? Oh yeah I think I should give them some money, but currently I don't like any of the outfits and they're about a tenner each or something, which puts me off, if it was maybe a pack of 5 for £15 or something, and I liked a few of them, I think something like that I'd be much more likely to spend. I'm playing this a lot at the moment. I bought in with the Early Access founder's pack last year for the Save the World campaign but have recently got into its Battle Royale mode and having a ton of fun with it. I stumped up the VBucks for the season 3 battle pass and so am currently working my way through that, which is a great incentive to keep playing as there are some cool unlocks to earn along the way. I bought in mid-season so probably won't get to tip tier this time around, but I already have enough VBucks to buy the season 4 pass at the end of the month. I've gone back to the Save the World campaign as well to do the daily quests as you earn VBucks to spend in Battle Royale. I'm using the same control method in that mode as Battle Royale now which they implemented recently, so the game controls the same across each mode. I still have a code for the founder's pack on PS4. If anyone would like it, they can have it. Ok @Blakey I'll send it over when I turn on my PS4 next, it has to be sent via the game. Ah ok yeah that's cool, I've got the alert now and am just patching the game first before it'll let me accept. Cool, let me know if it works OK! Been trying out a bit of Fortnite on the iPad tonight. i'm still playing this, really enjoy it in squads, solo is too stressful for me. finished the battle pass tonight, still got the extra challenges to do. 50v50 v2 mode is live now. I played a few matches earlier and it was crazy! I think I'm 87 on the battle pass. Hopefully reach 100 before season four begins. I might have to get the Battle Pass, I googled it and it's apparently only £8 which is a pretty great deal. I guess I'll need to get another one next season or something? But yeah, still good value. I should've mentioned this in my previous post, but I really like how everything carries over from one platform to the next, I logged into my PSN account thru the iOS app and everything was there waiting for me as I let it. cool, i'll have to give the new 50v50 mode a go, some crazy forts got built in the old one. the rocket mode was pretty fun for a few goes too. yeah the current battle pass ends soon and like you say, the new one would cost again, so probably better to wait for the new one now. 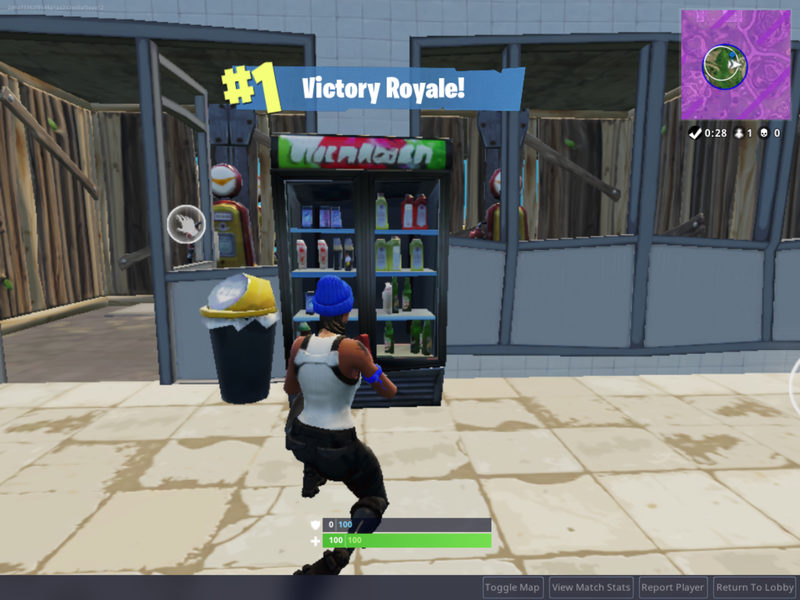 Squads Victory Royale before work. I was totally on board until you showboated at the end. I think that was deserved to be honest, Ed earned his right to emote like silly. Massive update today for the opening of Season 5. Gyro/motion controls are now available on Switch.